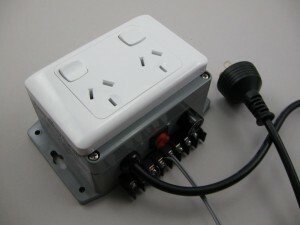 A safety protection device that will cut power to any connected equipment when the temperature rises too quickly or exceeds the maximum (approx 46 Deg-C). Detects temperature rate-of-rise and peak, has it’s own temperature sensor, directly switches mains power, sounds an internal alarm and optionally triggers an external system. Can also monitor one or more smoke detectors or other sensors. A slave unit can be connected to trip other power circuits. This is useful when a UPS is used to trip the supply to the UPS and the output from the UPS. We can supply the unit configured to switch the output power on when tripped. This would be useful for controlling ventilation fans or pumps ie. sump pumps. Using a moisture sensor rather than a smoke detector, the unit could switch on a pump and raise the alarm. Install the temperature sensor in the exhaust airflow path or duct. Somewhere where the air exiting the machine must pass. If a fire occurs within the machine the temperature of this air will rise. We can not detect smoke because the normal cutting process can produce smoke. Plug it in and switch the power on. Wait the 45 second settling time, during which the unit will not trip.